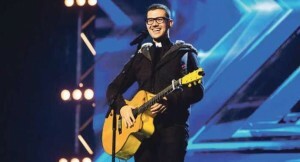 Father Rob Galea’s living example of how to be ‘cool and Catholic’ will take centre stage before thousands of young people at next month’s Australian Catholic Youth Festival. The assistant parish priest from Bendigo is a guest speaker at the festival in Adelaide, as well as leading workshops and performing. Fr Galea last month said he was hoping to have released one of two new singles before the festival, which runs from December 3 to 5. “We have a lot of new and exciting things planned for Adelaide,” he said. One of his workshops, “Jesus and the X factor”, will explore how youth can live as Christians in the world of popular culture. It’s a disparity he’s successfully merged as a pop-singing consecrated man and which was recently evidenced through his audition performance on the popular Australian television show X-Factor. Fr Rob shone on the secular stage singing “Don’t You Worry Child” by Swedish House Mafia. He says the song choice reflected Psalm 128 – that God has a plan for everyone. The 33-year-old Maltese-born priest has sold tens of thousands of albums, ministers to more than 150,000 young people each year, and has toured the United States, India, Canada and Europe. Last month he performed before 25,000 youth at a Christian conference in the US. He’s currently writing songs for secular artists for an album for Ministry of Sound Australia– the nation’s largest independent dance music label. X-Factor judges pop princess Dannii Minogue, US rocker Chris Isaak, Guy Sebastian and James Blunt thought Fr Rob was ‘out of this world’ when all four voted him through to the next round and later tweeting him praise. After the first week of boot camp though, Fr Rob decided to leave the show. “The opportunity to be part of X-Factor came my way and I took it but at the same time, having realized the 16-week commitment required, I couldn’t commit to that and all the other commitments to my parish and my youth work that are ultimately more important to me than fame,” he said. Fr Rob was born in Malta to Catholic parents. He says he stopped attending Mass as a tween when life choices led to depression, anxiety and addiction before he experienced a deep conversion at 16. He did not consider the priesthood until six years later after meeting a young charismatic priest in Italy while touring with his Catholic ministry band. Despite graduating with a university degree in commerce and expecting to take over his father’s businesses, he entered the seminary and left behind his fiancé of four years to pursue his vocation. Fr Rob travelled to Australia to complete his final years of seminary life in 2007 and has remained since, ministering to parishioners of the Shepparton diocese and leading a youth program which spans across three states and includes up to 1000 young people each year.